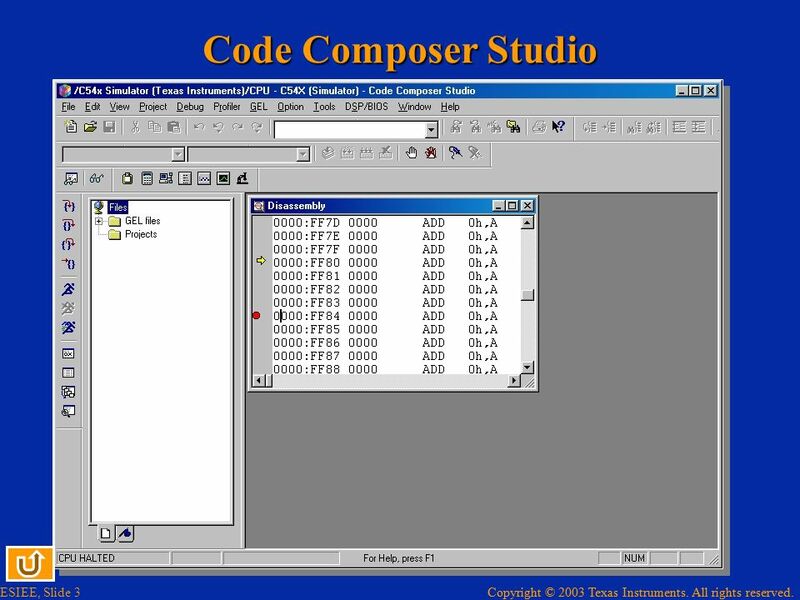 3 Code Composer Studio Code Composer Studio (CCS) consists of multiple windows. At the bottom left you have the « project window » where you can manage the software project you are working on. At the bottom right you have the « edit window », that is used to display and memory contents. 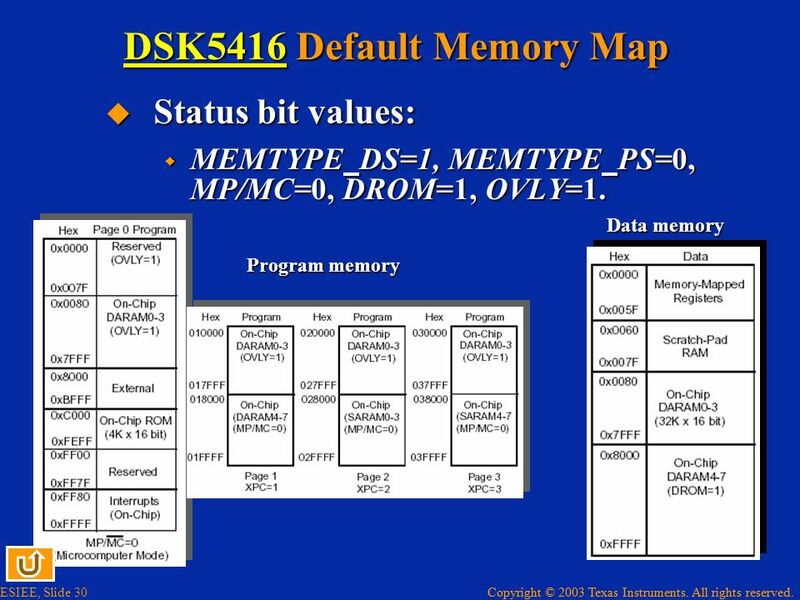 An important window is the « disassembly window » that displays the reverse assembly from the program memory of the DSP. The yellow arrow and the red point on the left margin of the « disassembly » window indicate respectively the current position where in code the DSP program is halted (here at the address 0xFF80), and the position of a break point. Around those window are icons that are short-cuts to useful actions such as run, step, halt, … All these actions can be accessed through the menus at the top of the screen. 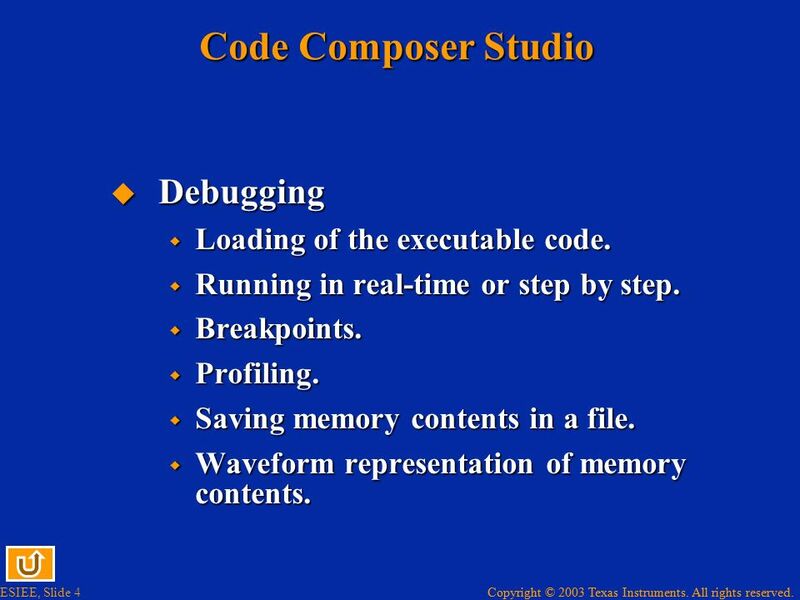 4 Code Composer Studio Debugging Loading of the executable code. 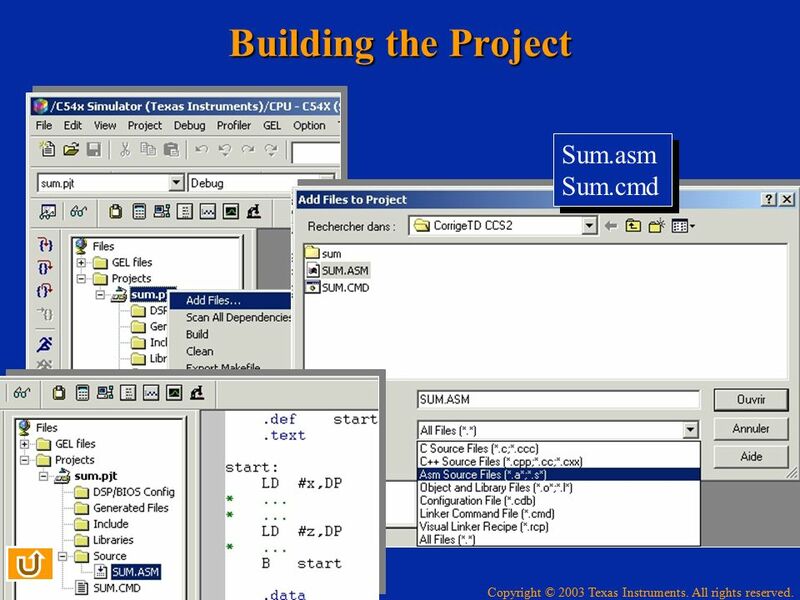 Source files (C,C++ and/or assembly) (*.c,*.asm) Text files with strict syntax checking, especially for assembly language *.asm. 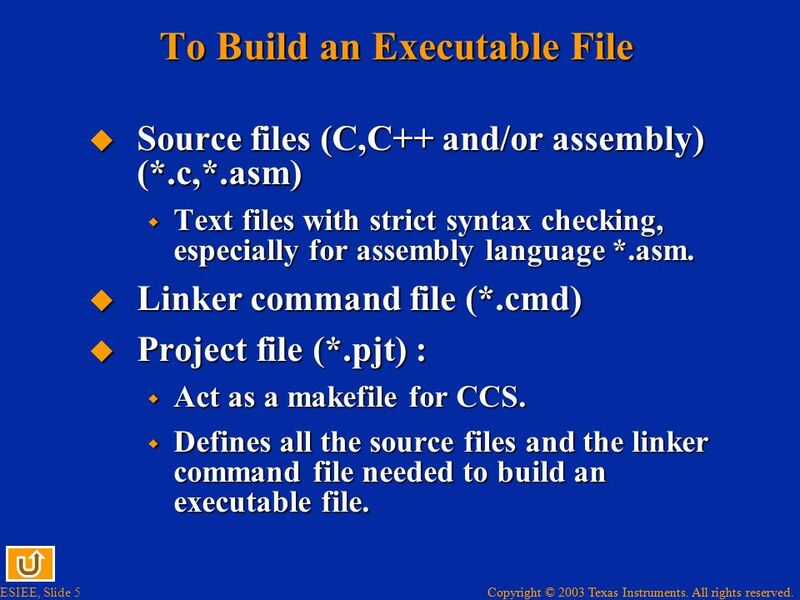 Linker command file (*.cmd) Project file (*.pjt) : Act as a makefile for CCS. 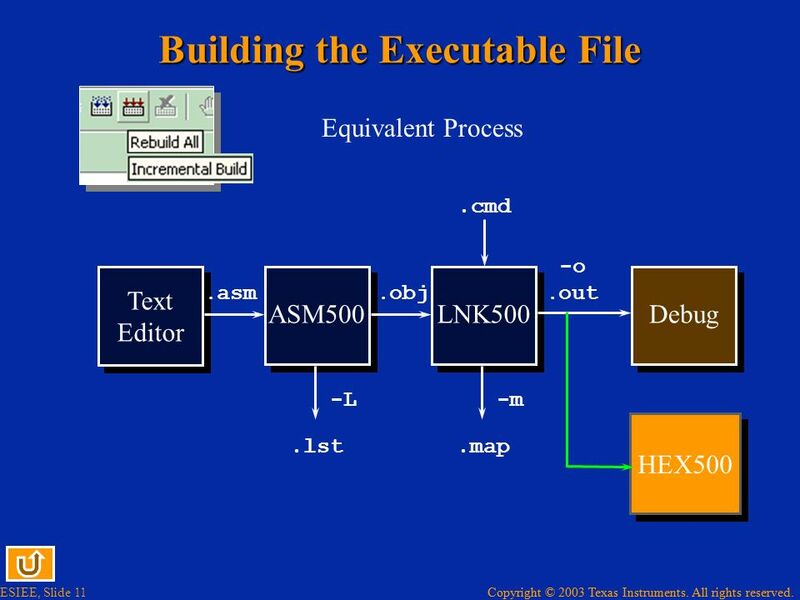 Defines all the source files and the linker command file needed to build an executable file. 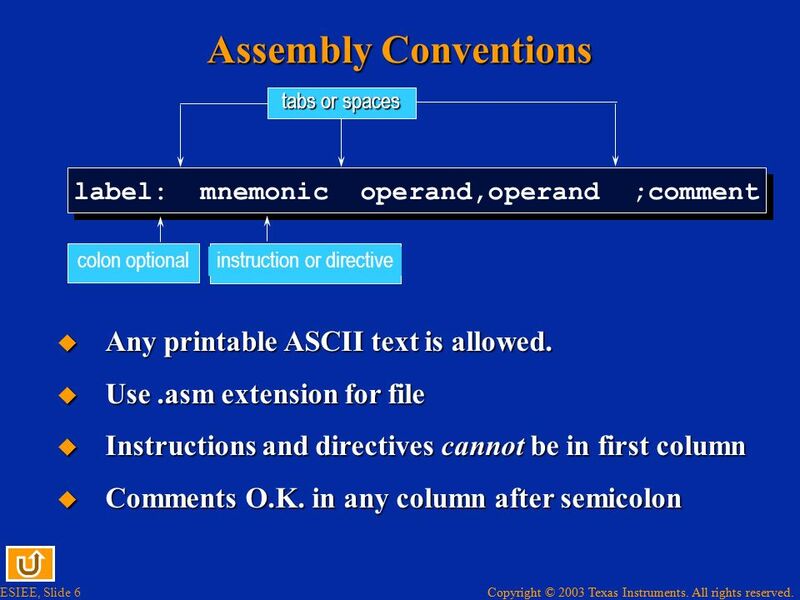 6 Assembly Conventions Any printable ASCII text is allowed. tabs or spaces label: mnemonic operand,operand ;comment colon optional instruction or directive Any printable ASCII text is allowed. Use .asm extension for file Instructions and directives cannot be in first column Comments O.K. in any column after semicolon All the DSP instructions or directives must be in the second column. 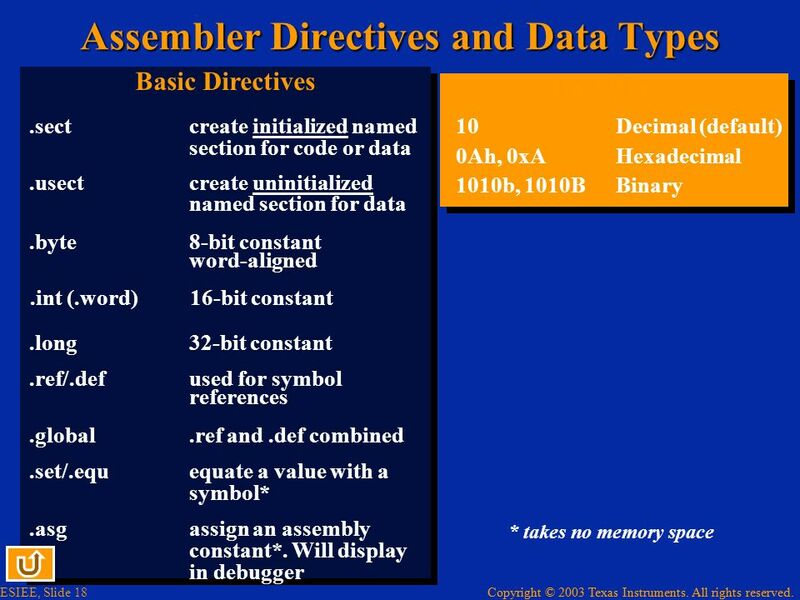 Directives are specific commands that are used to give particular requirements to the assembler or to the linker, for example, where in memory to place variables. 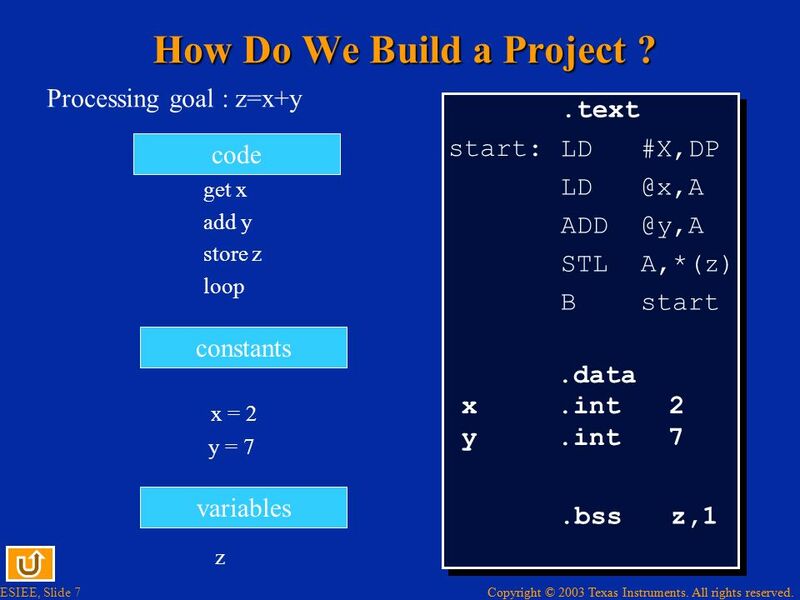 7 How Do We Build a Project ? 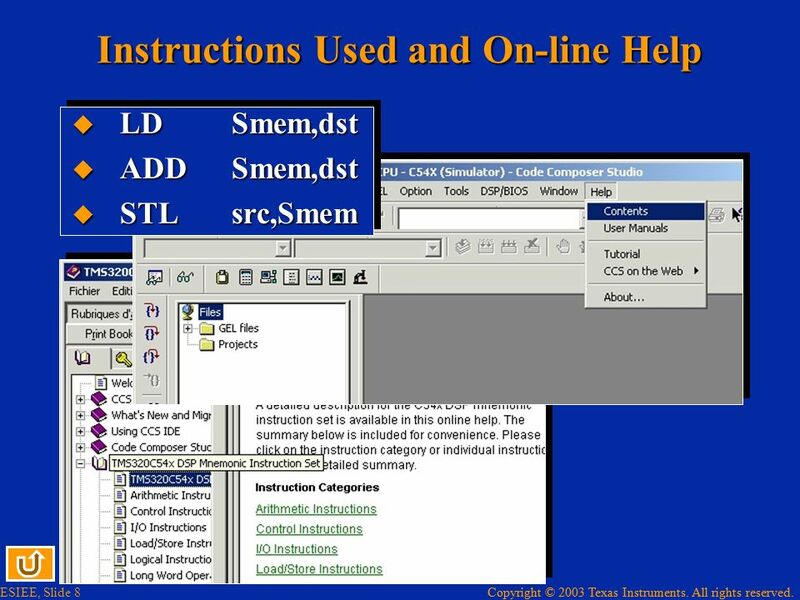 LD Smem,dst ADD	Smem,dst STL	src,Smem From CCS online help can be found for the instruction set of the specified DSP. PAGE 0: VECS: origin = 0080h, length = 0080h /* Internal Program RAM */ PRAM: origin = 100h, length = 1f00h /* Internal Program RAM */ PAGE 1: SCRATCH: origin = 0060h, length = 0020h /* Scratch Pad Data RAM */ INRAM: origin = 2000h, length = 1fffh /* Internal Data RAM */ } SECTIONS .text > PRAM PAGE 0 .data > INRAM PAGE 1 .bss > SCRATCH PAGE 1 The Linker Comand File tells the linker where the code, data etc. are found on the DSP chip. It is processor specific. 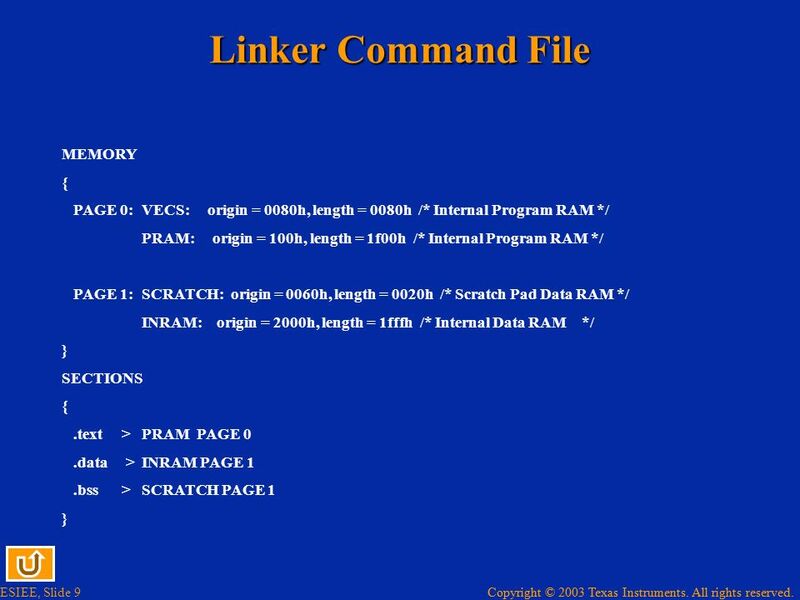 The linker command file is made of two parts : The « MEMORY » section which identifies the physical memory resource of the target hardware. « PAGE0 » identifies program memory space and « PAGE1 » data memory space. For this instance we have a memory bank with symbolic name « PRAM » in program memory space starting at address « 0x100 » and having a length of « 0x1F00 » words. 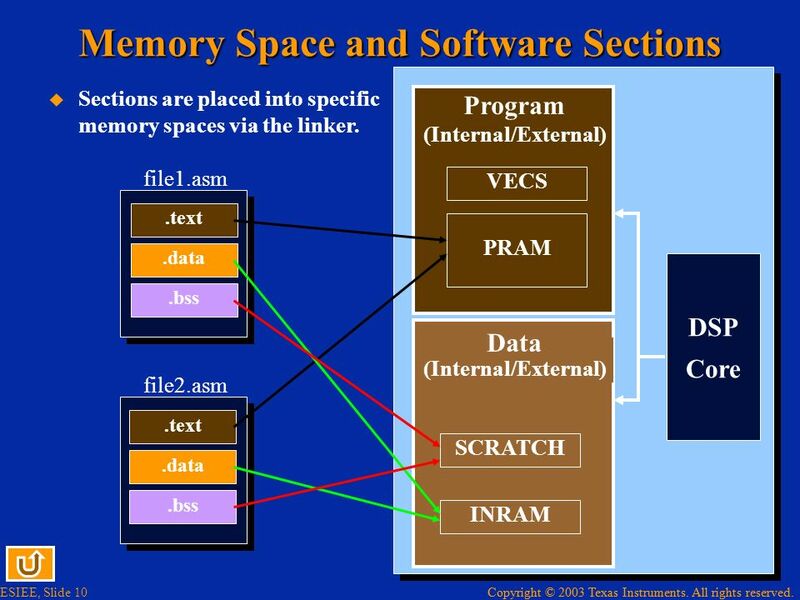 The « SECTIONS » section targets the different parts of the source files into the specified memory banks, for example all the « .text » parts of the input files will be targeted into the program space memory bank called « PRAM ». It must be emphasized that there could be several «.text » segments in a source file and there could be many source files. Once the new project is created, a virtual directory tree appears in the project window. 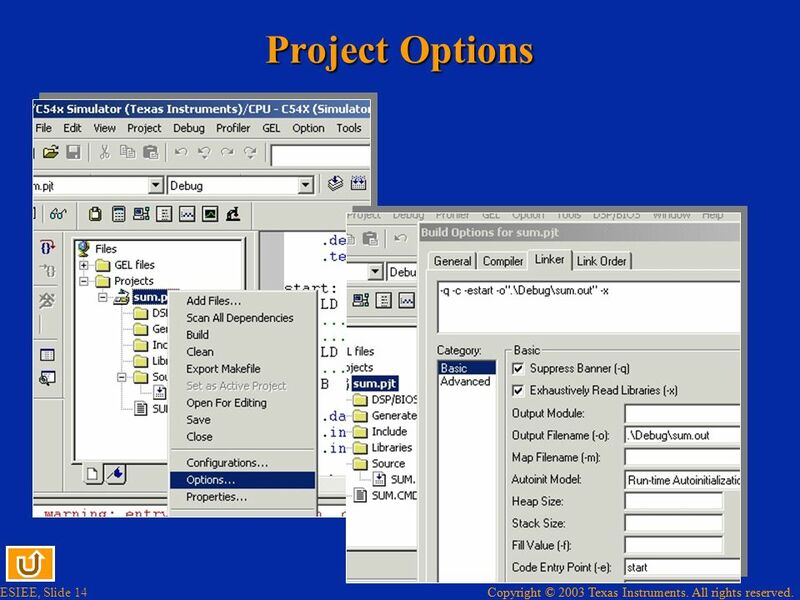 14 Project Options Project options can be set up if necessary such as the program entry point. here being set to the symbolic label « start ». 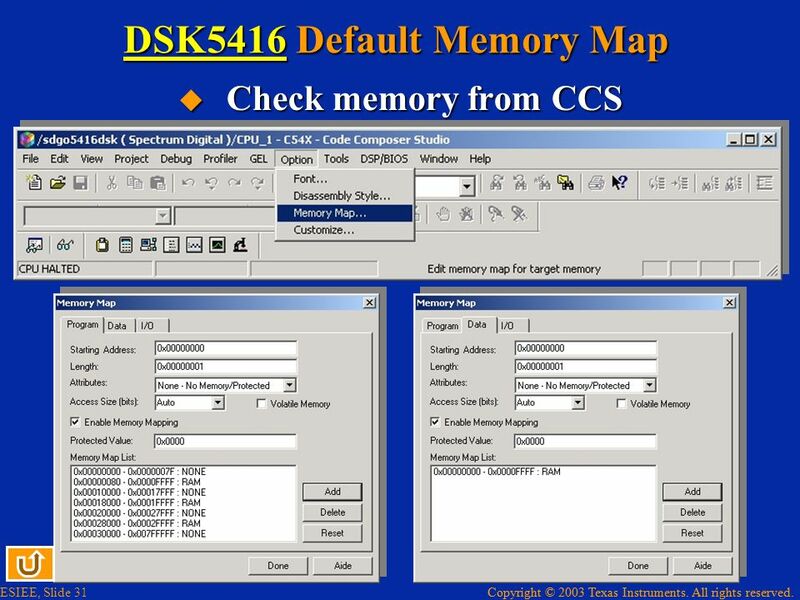 In this way the program counter of the DSP is loaded with the address of the label when the program is loaded into the program memory of the DSP. 15 Project Build Once all the necessary files have been gathered in project, it could be build thanks to « rebuild » or « incremental build » icons or from « Project>build » menu. It must be pointed out that « Project>Compile » does not build an executable file, but only object files. 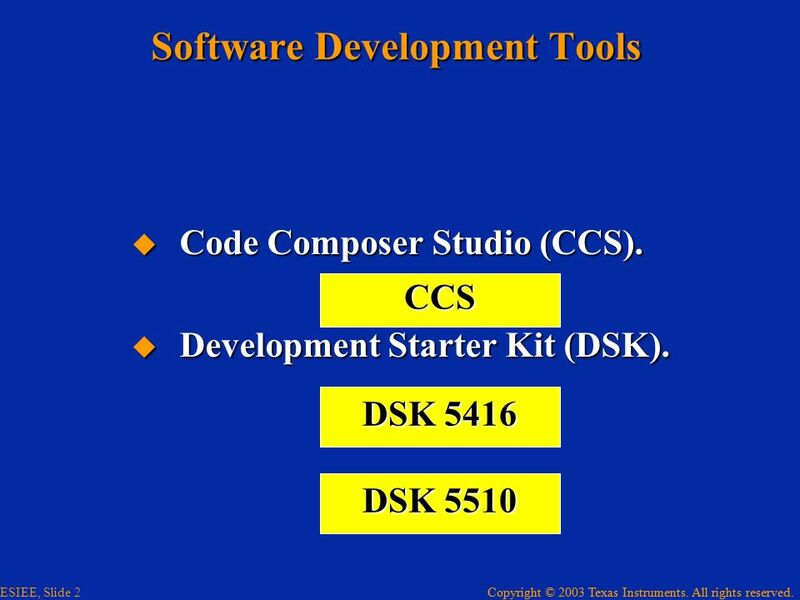 Once the project have been build, the executable file have to be loaded in the program memory of the DSP. 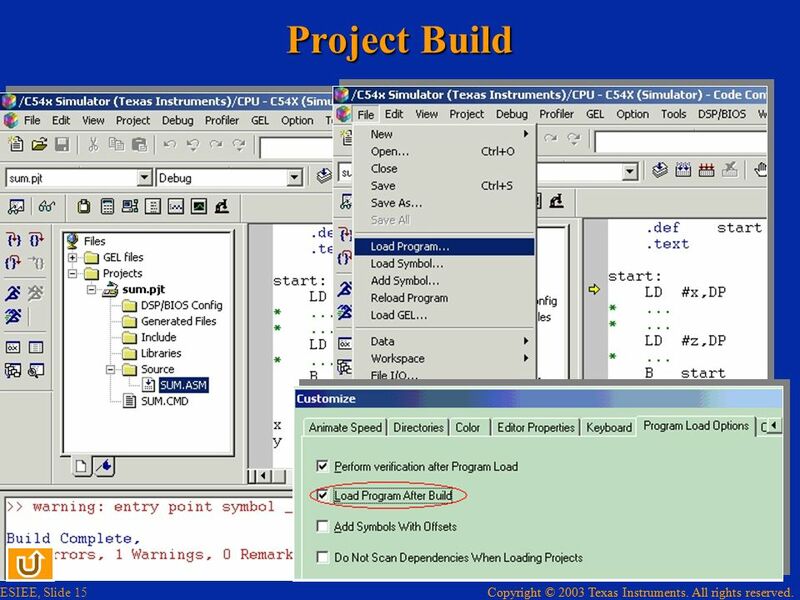 A safe configuration choice could be « Load Program after Build » set up in the « Option>Customize » menu. In this way the executable file is automaticaly reloaded in the program memory of the DSP after new code generation. Once the program is loaded, it can be executed, either step by step or at full speed. Many tools are provided for debugging, one of the most common are the breakpoints (highlighted by a red point in the left margin of the program being runned). When the program is stopped either by a breakpoint or by a « Debug>halt » command or by short cuts « Shift F5 », the contents of memory and CPU registers can be checked (and evnetually modified) to check the program. To look at the memory contents use « View>Memory » to pop up the « Memory Window Options » shown on the next slide. 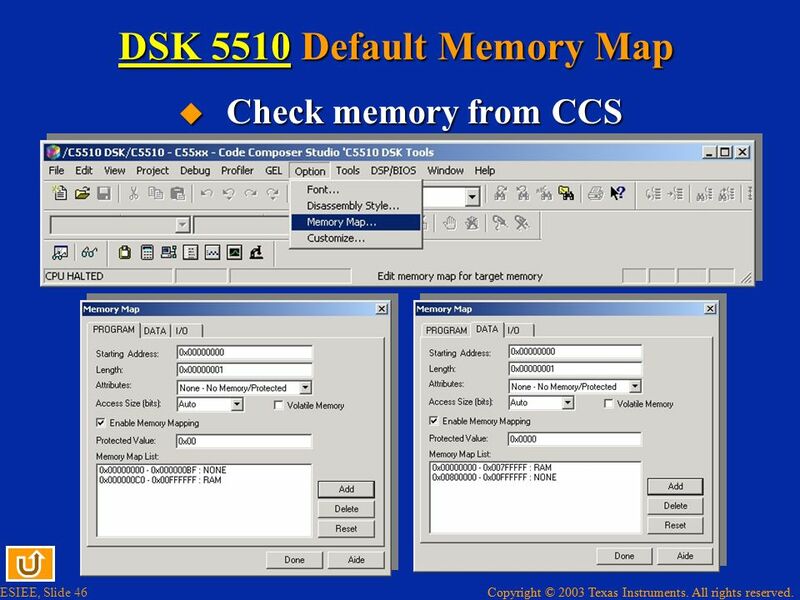 The « Memory Window Options » allows us to specify data or program memory. The address can be absolute or symbolic. The CPU registers can be accessed via « View>CPU Registers>CPU Registers ». 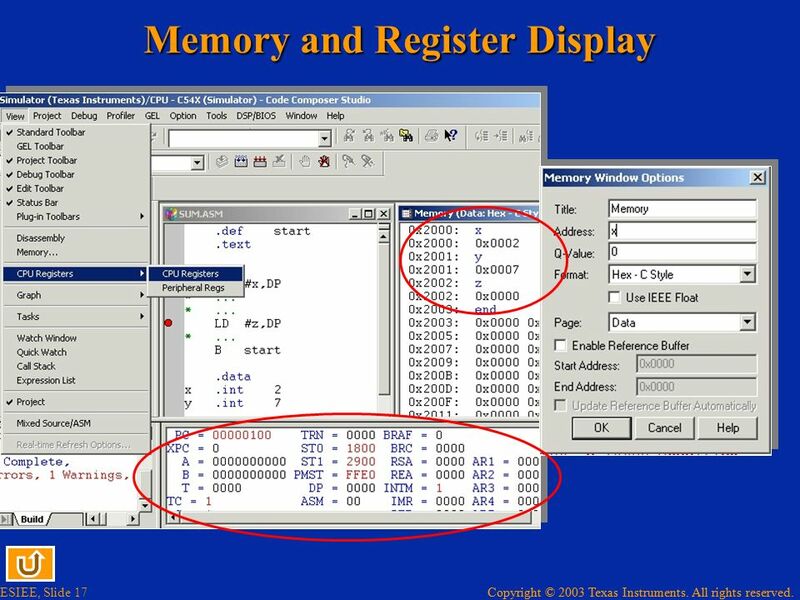 Each value can be modified directly on register or memory window. 19 Visual Linker 1 of 2 The linking process could use another method than the linker command file (*.cmd) as seen previously. It could use the visual linker which could be run from CCS. 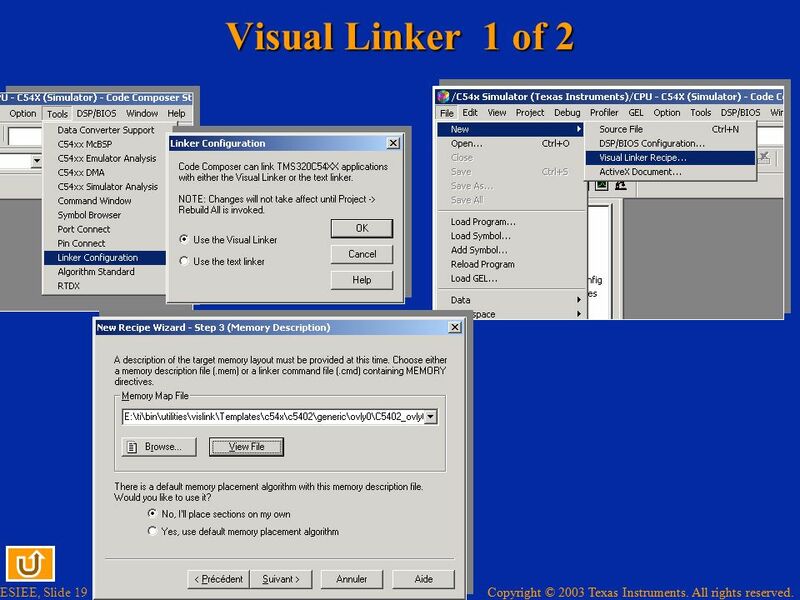 To use visual linker we have to proceed according to the following steps : First the visual linker must be selected for the link process using the menu « Tools>Linker Configuration ». Create a linker recipe that will be used by the link process using « File>New>Visual Linker Recipe. A wizard will be run and you have to provide some directives, one of them is the name of a file containing the description of the physical memory available on the target. 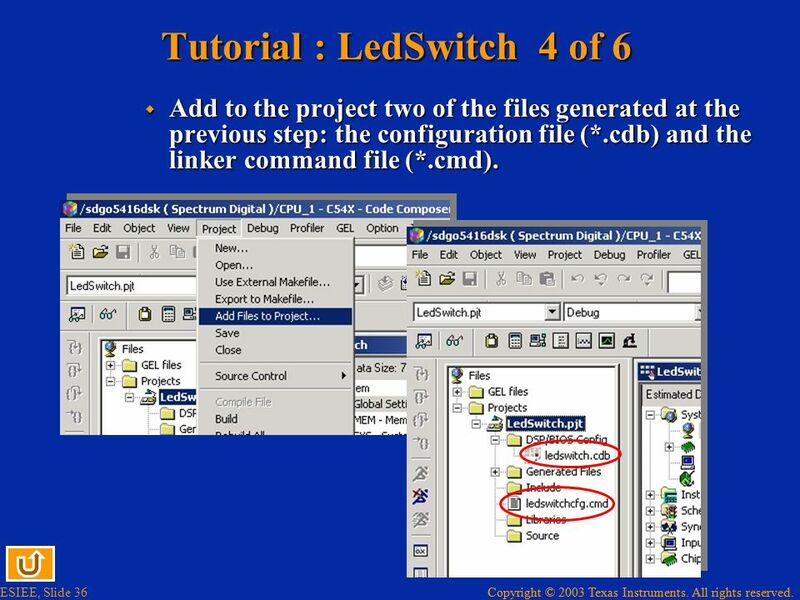 This information can be extracted from the traditionnal *.cmd file (memory section) or provided by a specific file (*.mem) many of them are provided in the Templates directory of visual linker installation directory for each DSP. 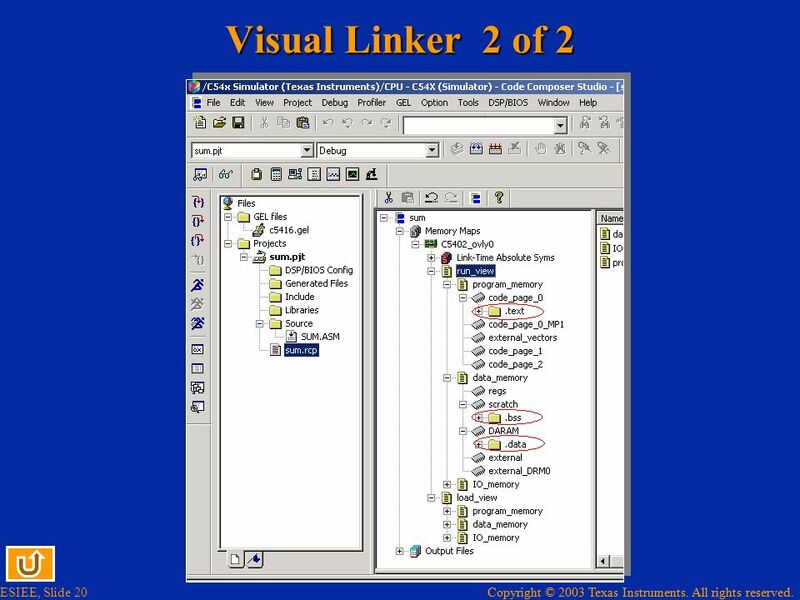 20 Visual Linker 2 of 2 Once this has been done all the sections can be graphically allocated to specific memory banks. The result of such process is shown on this slide. 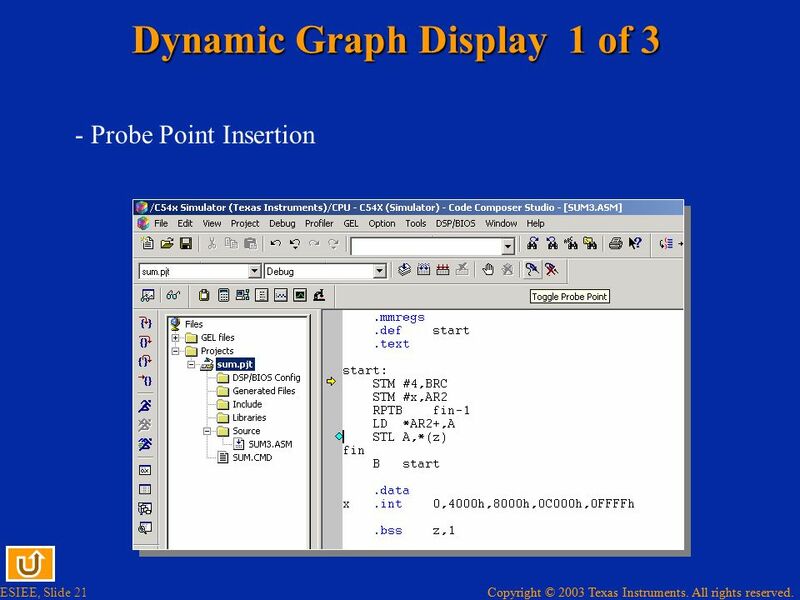 - Probe Point Insertion The contents of a memory word or memory bank can be displayed as a graph. The graph could be static or refresh by a specific event. We will give an overview the second case and the first will be obvious. The event that will refresh a graph will be a probe point. 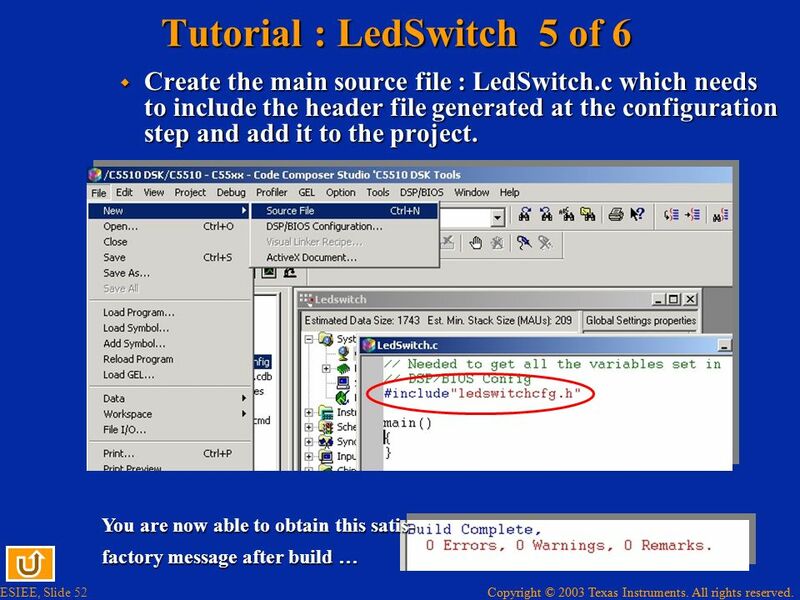 Each time the program reaches a probe point a specific action allocated to it will be run. The first task is to insert the probe point, This can be done by the icon « Toggle Probe Point ». The program used to illustrate this functionality generates a sawtooth signal by reading sample value in a look-up table writing them one after the other in a memory (z). We will display this memory content. 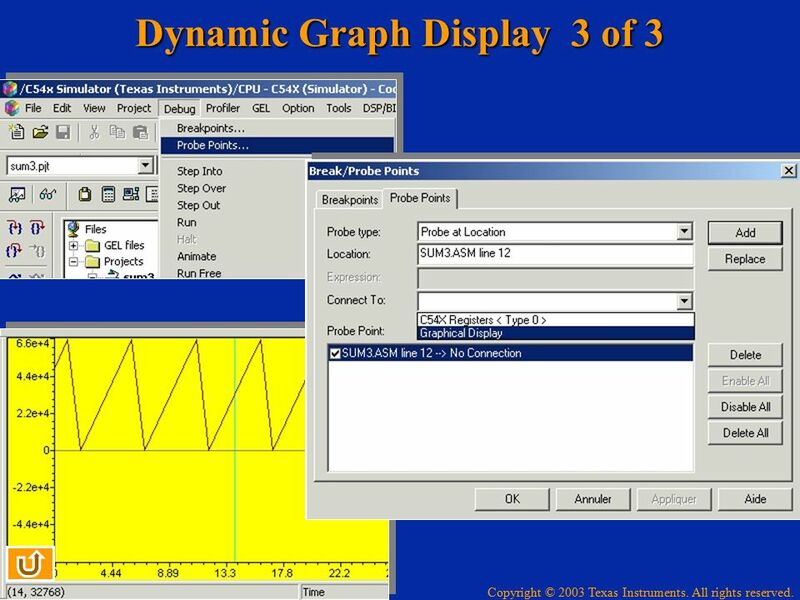 Display configuration Start adresse : z Acq buffer size : 1 Display size : 40 Data type : 16 bits unsigned Then a kind of graph must be chosen and configured. The probe point must be connected to the graphical display. Use « Debug>Probe Points… », select the right probe point and choose to connect it to Graphical Display (the title of the graphic window) and choose replace button. 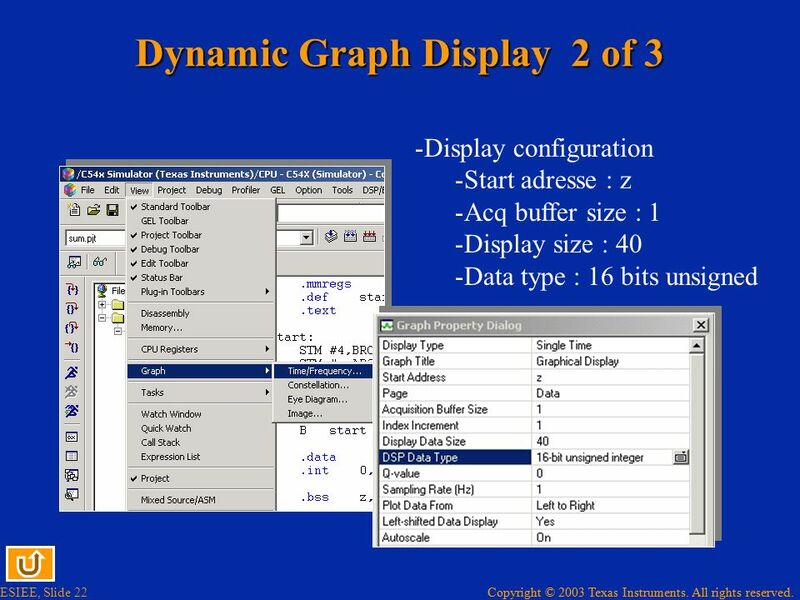 You can then run the program (F5 short cut key or « Debug>Run ») and the graphic display is refreshed each time the program goes over the probe point by an amount of data specified in the acquisition buffer size of graphic properties window (see previous slide). 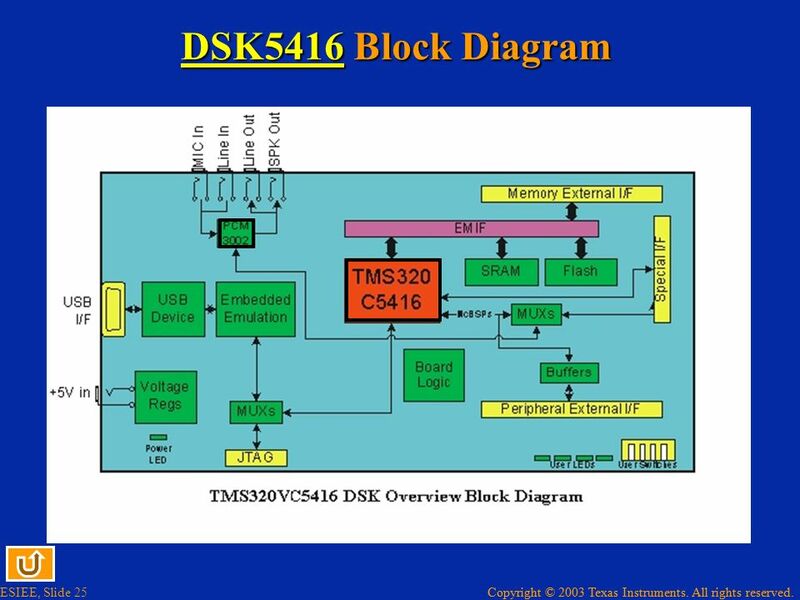 24 DSK5416 The DSK5416 is a development board embedding a TMS320VC5416 DSP, interface for CCS through USB or JTAG header (requires a XDS510 family tool) for software development and debug, some « human interface » components: leds, switch, audio interface, and finally three expansion buses to extend the system through hardware add-on boards. 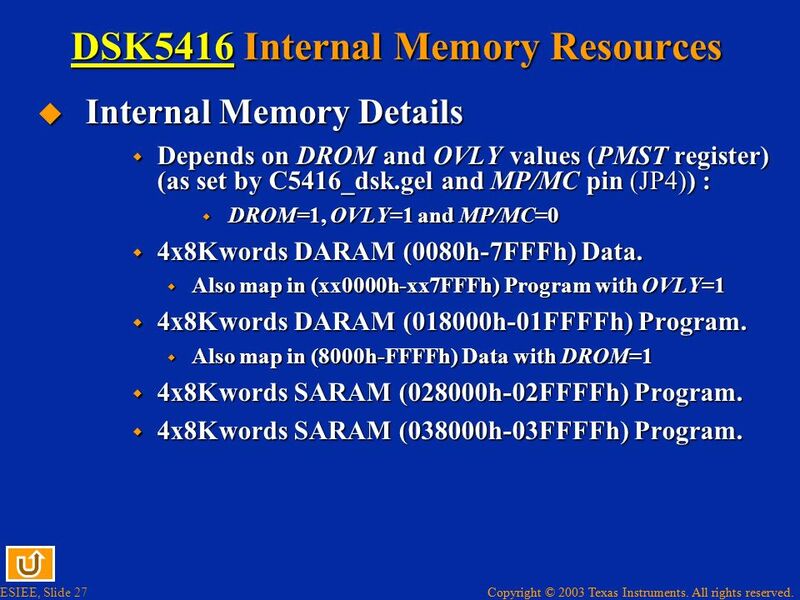 Internal Memory Details Depends on DROM and OVLY values (PMST register) (as set by C5416_dsk.gel and MP/MC pin (JP4)) : DROM=1, OVLY=1 and MP/MC=0 4x8Kwords DARAM (0080h-7FFFh) Data. Also map in (xx0000h-xx7FFFh) Program with OVLY=1 4x8Kwords DARAM (018000h-01FFFFh) Program. Also map in (8000h-FFFFh) Data with DROM=1 4x8Kwords SARAM (028000h-02FFFFh) Program. 4x8Kwords SARAM (038000h-03FFFFh) Program. Configured by DM CNTL register located at 64Kwords SRAM 2x32Kwords (SR PAGE0 and SR PAGE1): Data: (MEMTYPE DS1=1) All pages, specified by DM PG[4..0]1, are seen in the (8000h-FFFFh) address space if DROM=0. Program: (MEMTYPE PS1=1), mapped on : SR PAGE0: h-007FFFh if OVLY=0, SR PAGE1: h-00BFFFh always, 00C000h-00FF80h if MP/MC=1. 1MEMTYPE DS, MEMTYPE PS, DM PG[4..0] are bits field of DM CNTL register. 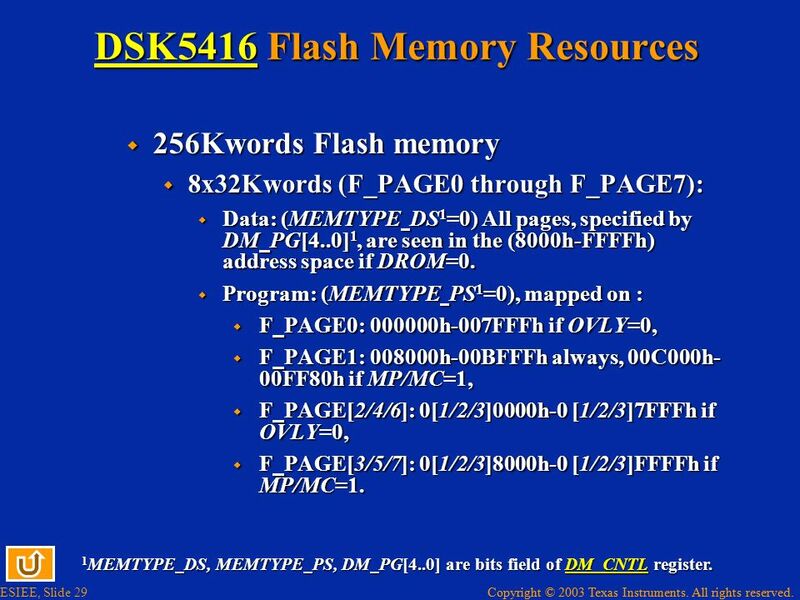 256Kwords Flash memory 8x32Kwords (F_PAGE0 through F_PAGE7): Data: (MEMTYPE DS1=0) All pages, specified by DM PG[4..0]1, are seen in the (8000h-FFFFh) address space if DROM=0. Program: (MEMTYPE PS1=0), mapped on : F PAGE0: h-007FFFh if OVLY=0, F PAGE1: h-00BFFFh always, 00C000h-00FF80h if MP/MC=1, F PAGE[2/4/6]: 0[1/2/3]0000h-0 [1/2/3]7FFFh if OVLY=0, F PAGE[3/5/7]: 0[1/2/3]8000h-0 [1/2/3]FFFFh if MP/MC=1. 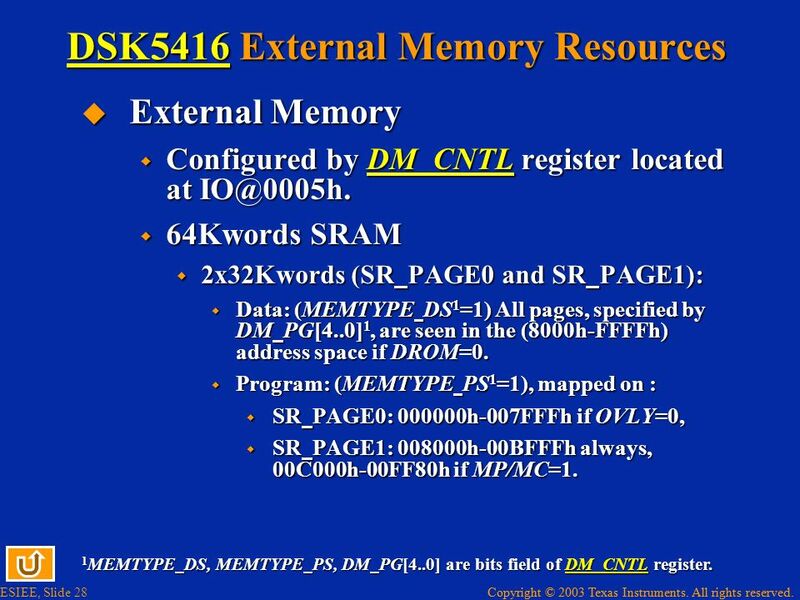 1MEMTYPE DS, MEMTYPE PS, DM PG[4..0] are bits field of DM CNTL register. 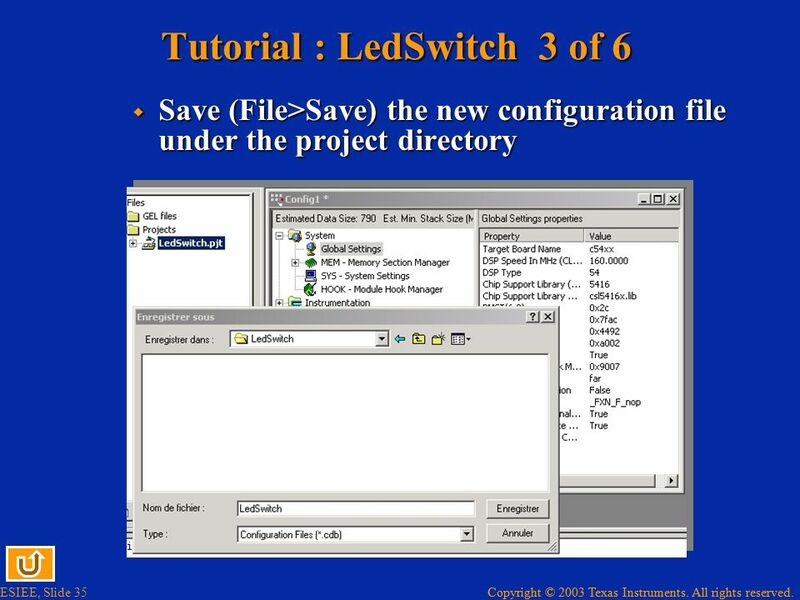 Four switches and LEDs Provided for user application Read and driven through USER REG USER REG[3..0]: drive leds USER REG[7..4]: read switches value. 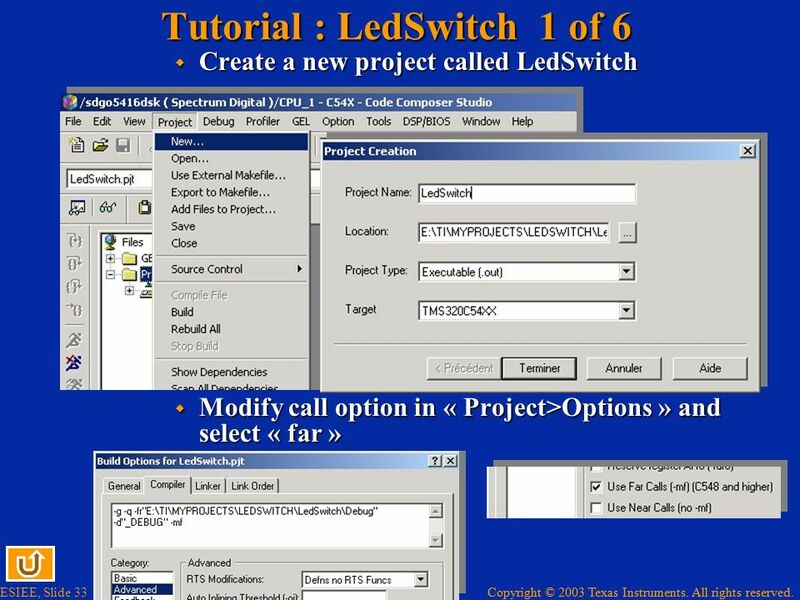 Tutorial : Create a project (LedSwitch) that will read switch position (ON/OFF) and that will set the corresponding Leds depending on the switch value. 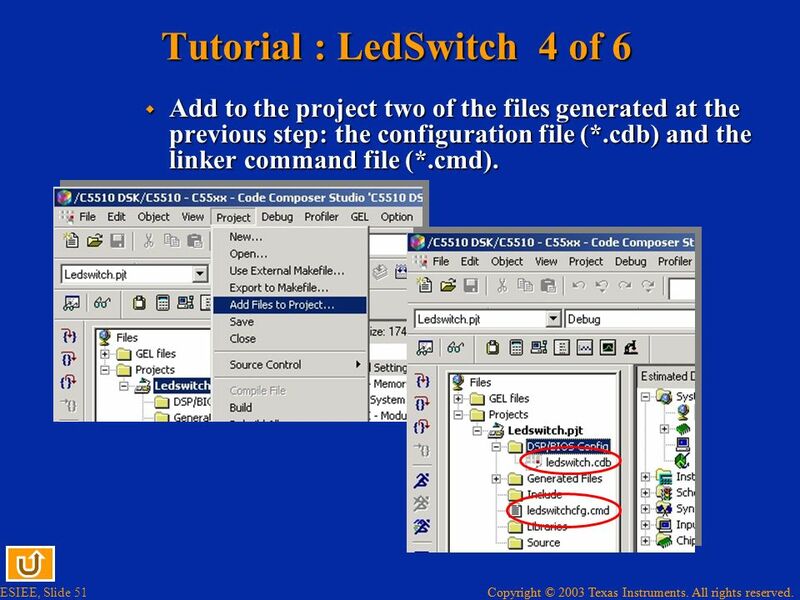 Add to the project two of the files generated at the previous step: the configuration file (*.cdb) and the linker command file (*.cmd). 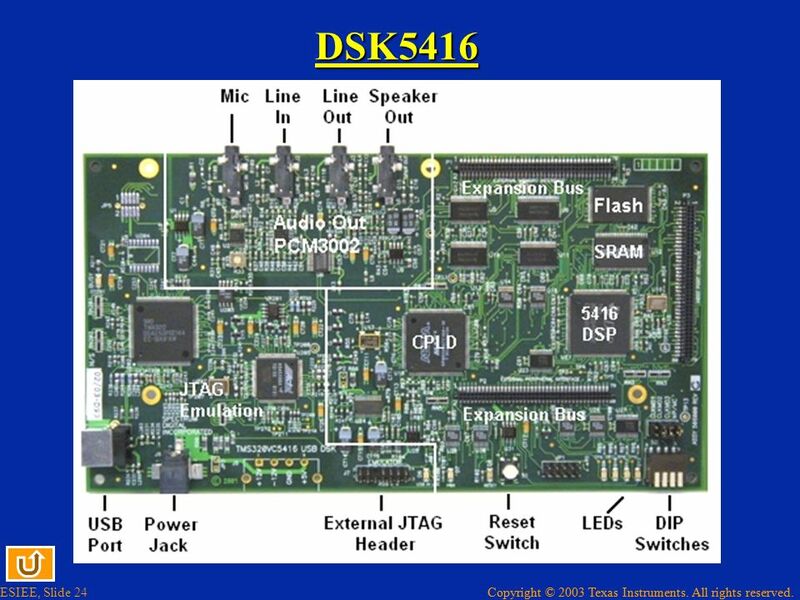 In the options of the project specify the use of « dsk5416f.lib » which contains C functions to access the hardware of the DSK board. Now you have a framework that you can add to in order to realize the desired application. 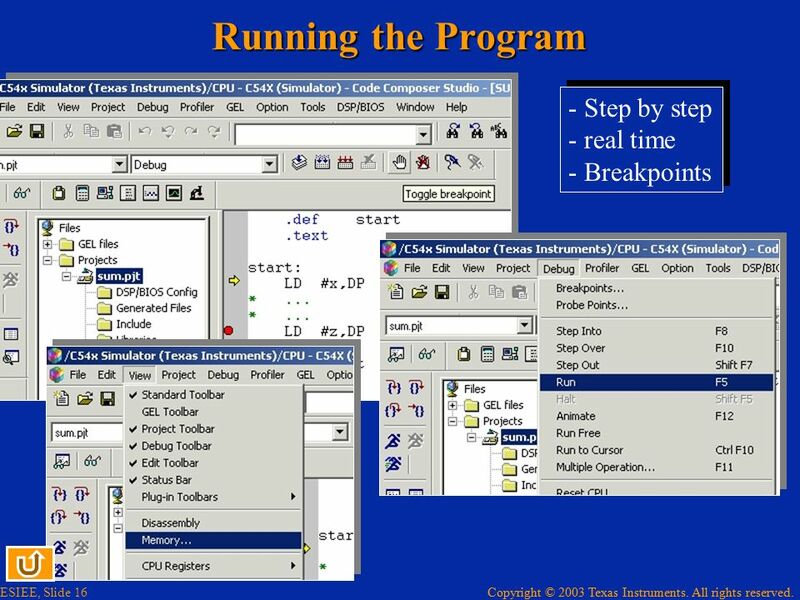 Once the program is completed, you build, load and run it. 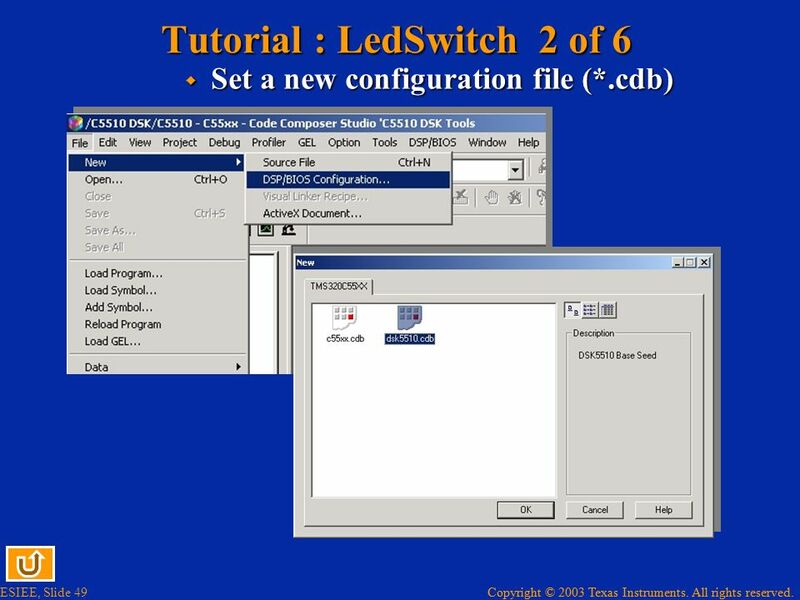 You must see the leds switching on and off as you toggle the switch. 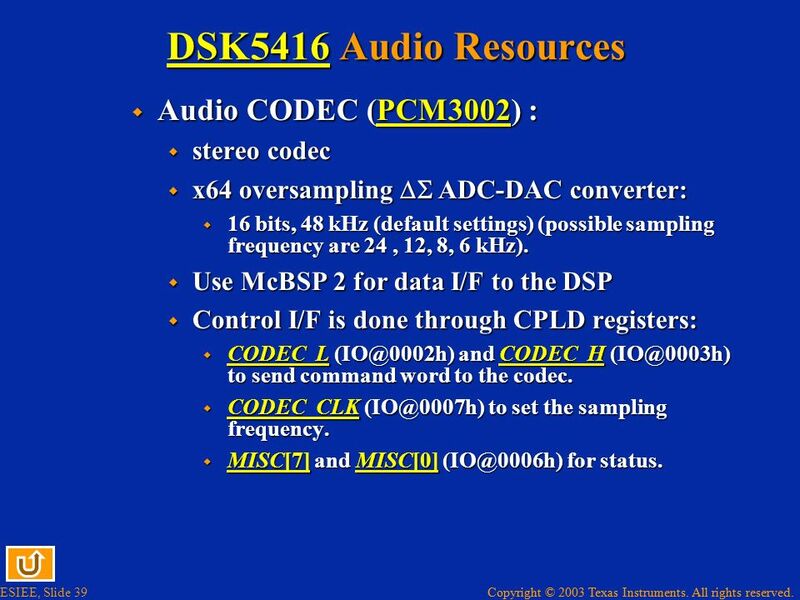 x64 oversampling DS ADC-DAC converter: 16 bits, 48 kHz (default settings) (possible sampling frequency are 24 , 12, 8, 6 kHz). Use McBSP 2 for data I/F to the DSP Control I/F is done through CPLD registers: CODEC L and CODEC H to send command word to the codec. 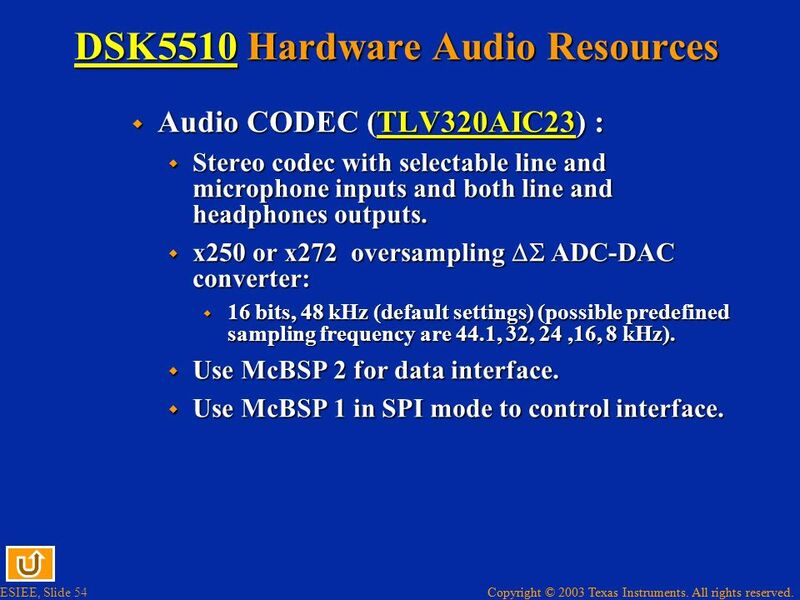 CODEC CLK to set the sampling frequency. MISC and MISC for status. 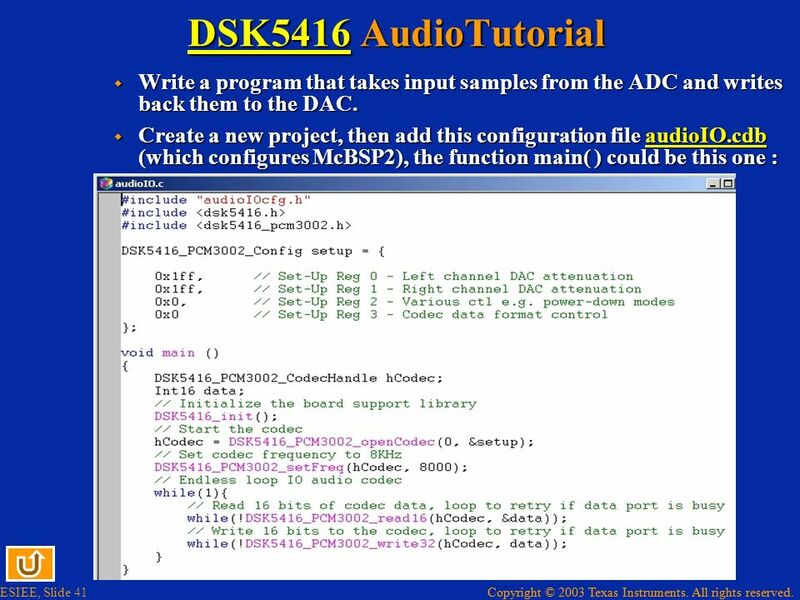 41 DSK5416 AudioTutorial Write a program that takes input samples from the ADC and writes back them to the DAC. 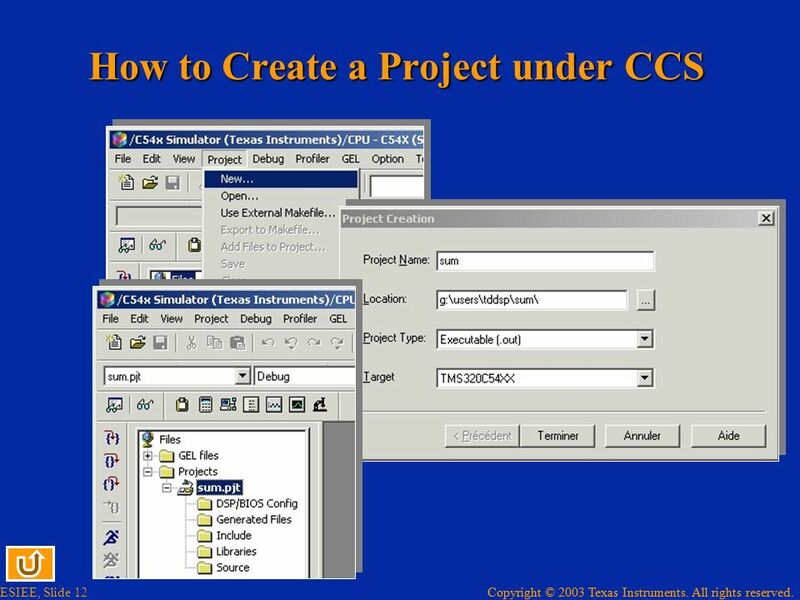 Create a new project, then add this configuration file audioIO.cdb (which configures McBSP2), the function main( ) could be this one : The (#include) part takes the header file generated by the configuration step « audioIOcfg.h », the header file that allows to use specific functions for DSK5416 and another one for further declaration specific to PCM3002. Then there is an array « setup » which contains configuration value for the «program register » of the PCM3002. (refer to datasheet). The main program declare an handle to access to the codec. 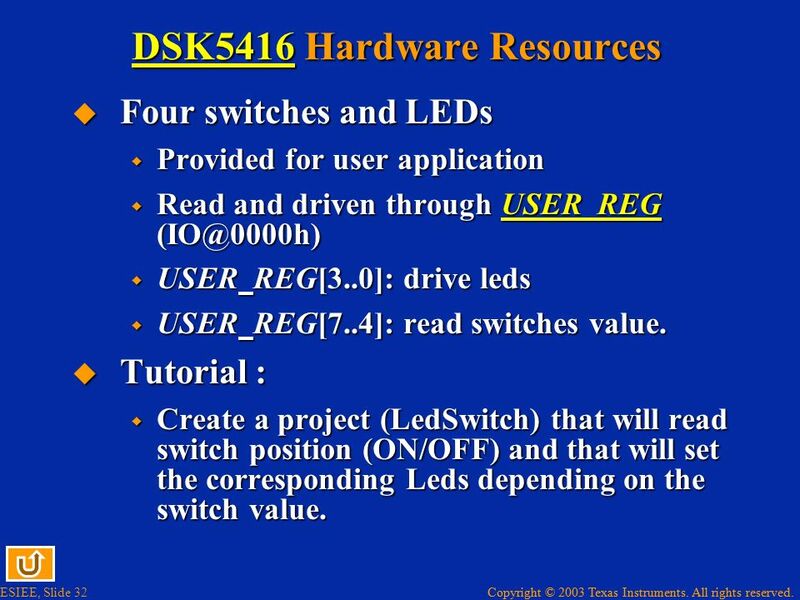 The board is initialized through « DSK5416_init() » as in the previous tutorial. The codec is opened with initialization array as a parameter. The sampling frequency is set to 8 kHz. Then the program enter in an infinite loop, where it waits for something to read from the ADC. 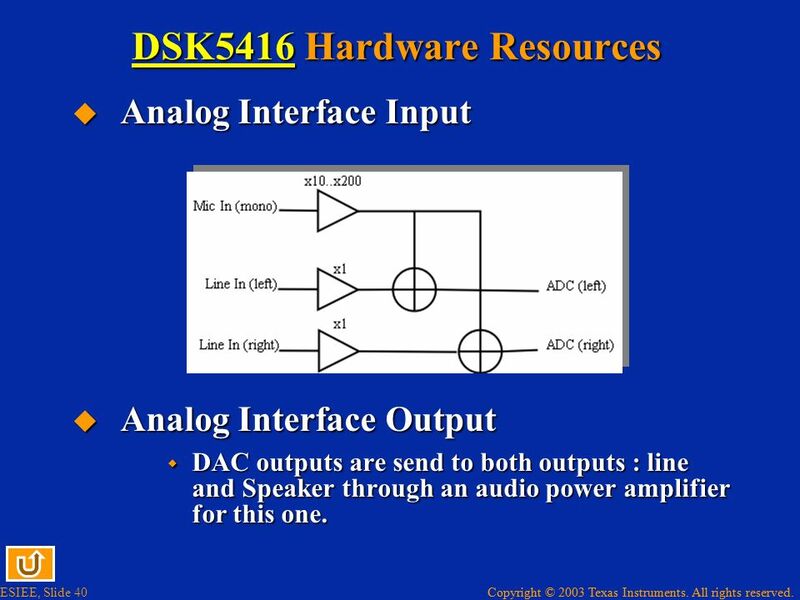 As soon as the ADC sends a sample it is written back to the DAC, then the program wait again for a new sample. 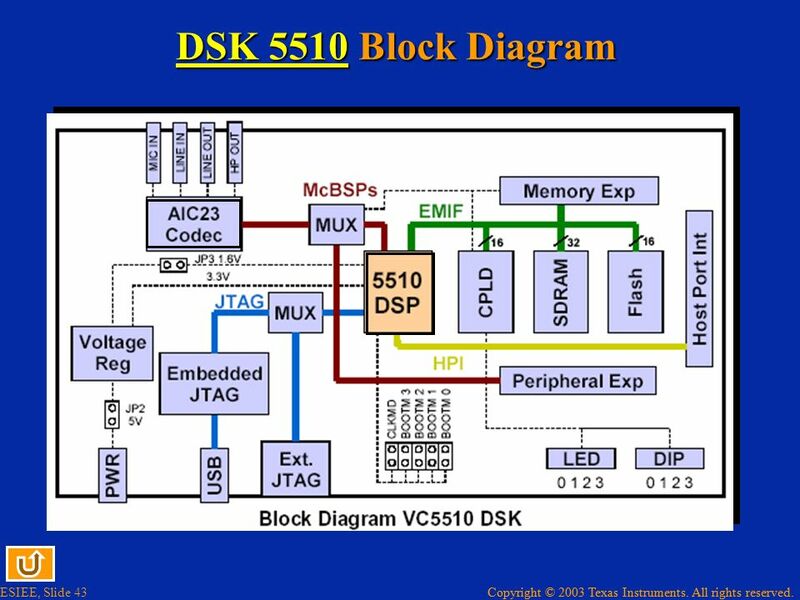 42 DSK 5510 The DSK5510 is a development board embedding a TMS320VC5510 DSP, interface for CCS through USB or JTAG header (requires a XDS510 family tool) for software development and debug, some « human interface » components : LEDs, switches, audio interface, and finally three expansion buses to extend the system through hardware add-on board. 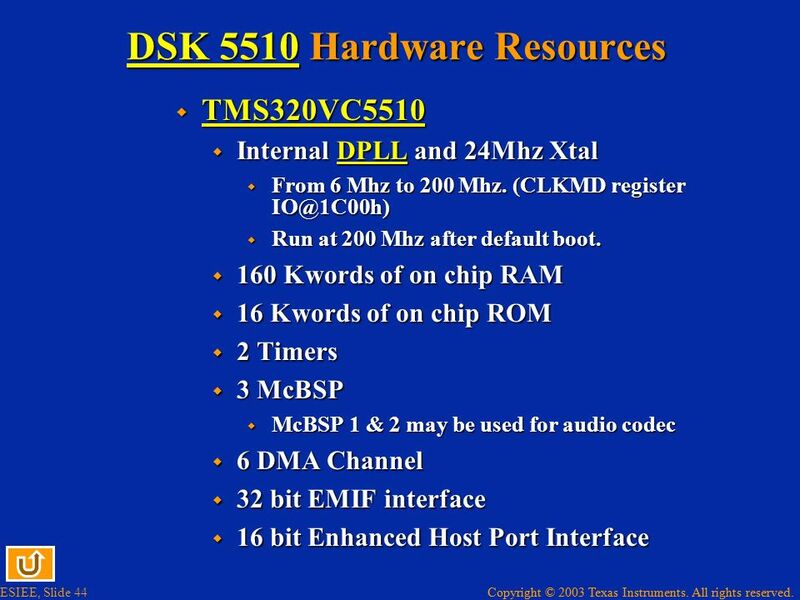 TMS320VC5510 Internal DPLL and 24Mhz Xtal From 6 Mhz to 200 Mhz. (CLKMD register Run at 200 Mhz after default boot. 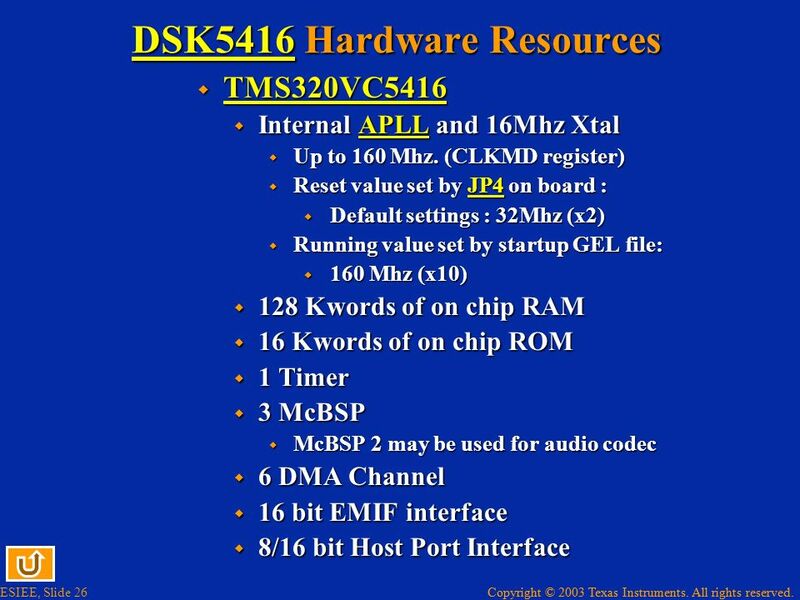 160 Kwords of on chip RAM 16 Kwords of on chip ROM 2 Timers 3 McBSP McBSP 1 & 2 may be used for audio codec 6 DMA Channel 32 bit EMIF interface 16 bit Enhanced Host Port Interface EMIF Interface : glueless to asynchronous memory (SRAM, EPROM) and synchronous memory (SDRAM, SBSRAM). 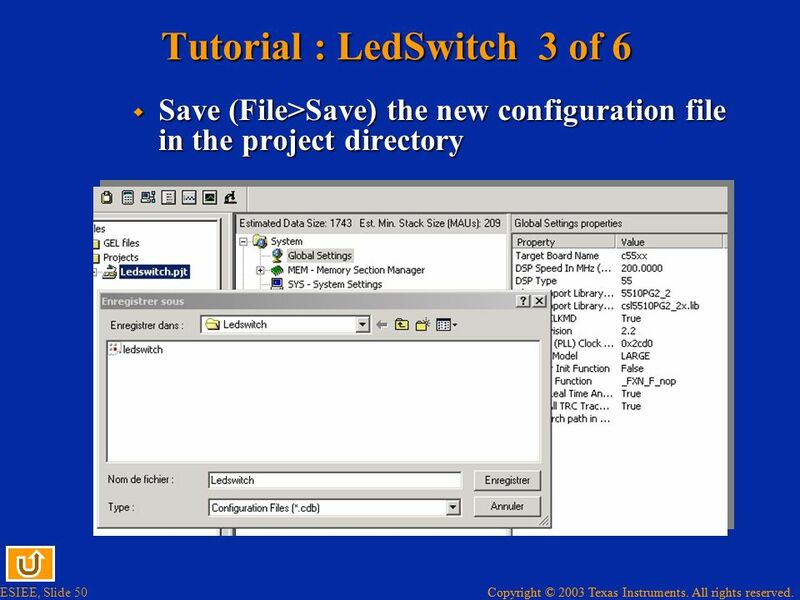 Four switches and LEDs Provided for user application Read and driven through USER REG USER REG[3..0]: drive leds USER REG[7..4]: read switches value. 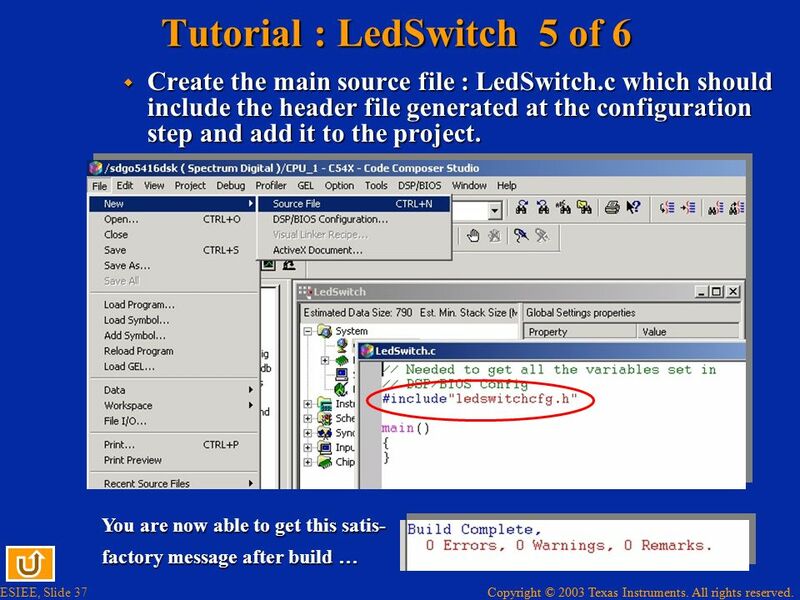 Tutorial : Create a project (LedSwitch) that will read switch positions (ON/OFF) and that will set the corresponding LEDs depending on the switch values. 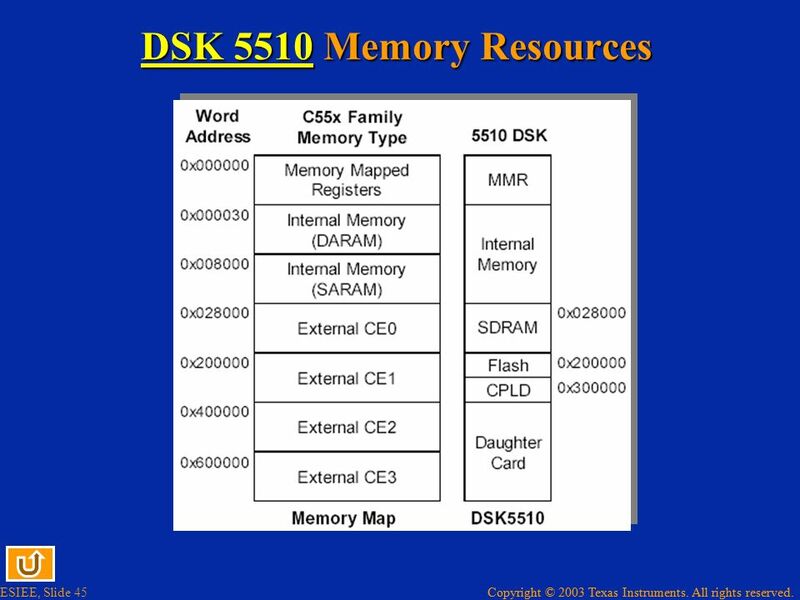 1Because of unified memory space, it can be decoded in data or prog memory space. 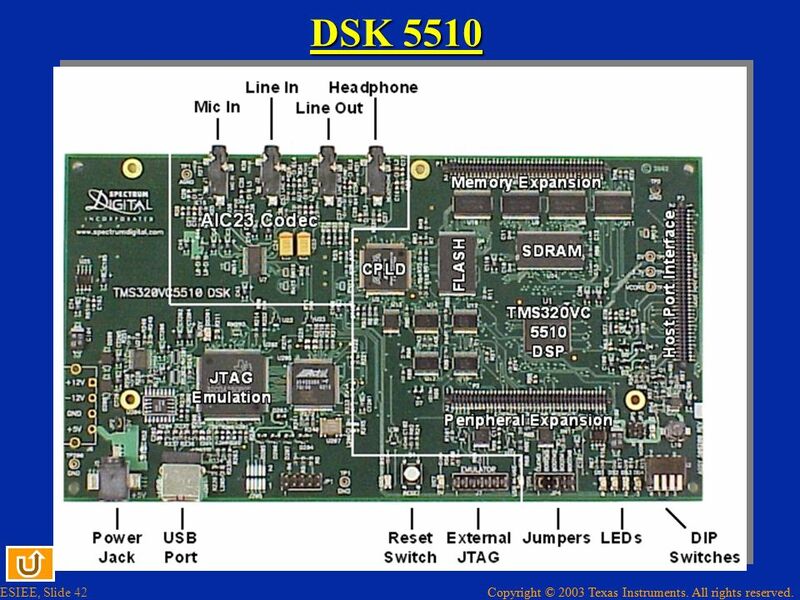 In the options of the project specify the use of the library « dsk5510bslx.lib » which contains C functions to access the hardware of the DSK board. Now you have a framework that you can use as the starting point for the particular application. Once the program is completed, you build, load and run it. 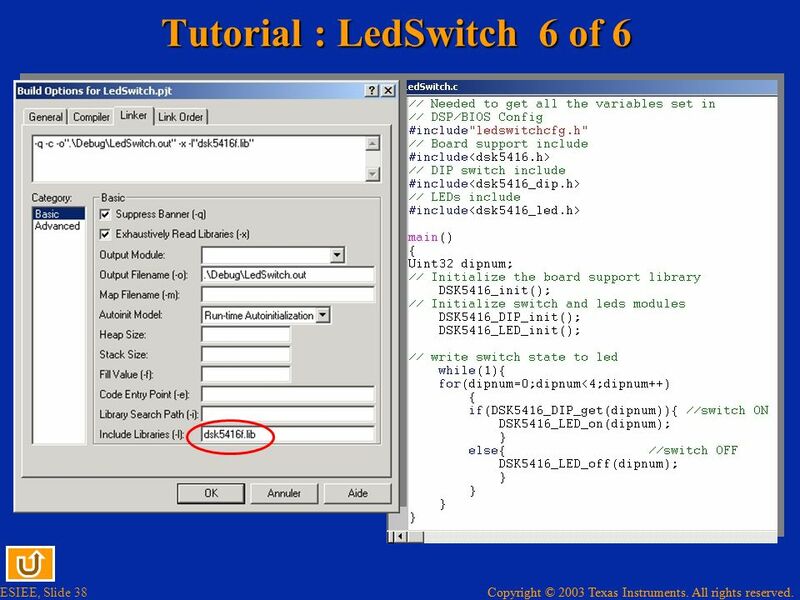 In this case you will see the LEDs switching on and off as you toggle the switches. Audio CODEC (TLV320AIC23) : Stereo codec with selectable line and microphone inputs and both line and headphones outputs. x250 or x272 oversampling DS ADC-DAC converter: 16 bits, 48 kHz (default settings) (possible predefined sampling frequency are 44.1, 32, 24 ,16, 8 kHz). Use McBSP 2 for data interface. 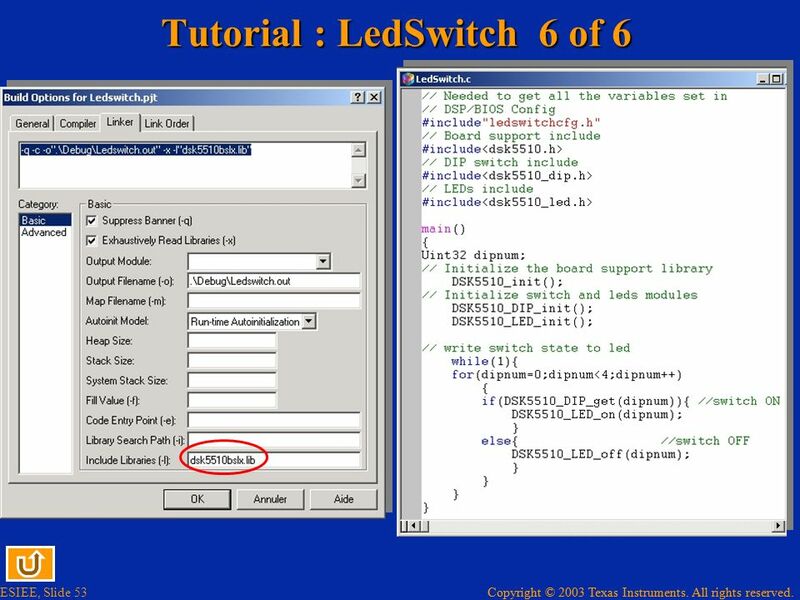 Use McBSP 1 in SPI mode to control interface. Here the Greek letters mean Delta-Sigma converter. Analog Interface Input Analog Interface Output DAC outputs are send to both outputs : line and Speaker through an internal audio power amplifier for this one. Microphone and Line Inputs (Left Line In and Right Line In) are selected through a multiplexer. The gain of the Microphone can be set either to 0dB or 20dB, to suit the sensitivity of the microphone being used. The gain of the line inpust are programmable from –34.5dB to 12 dB in 1.5 dB steps, where 0dB is 0.775V into 600 Ohms. 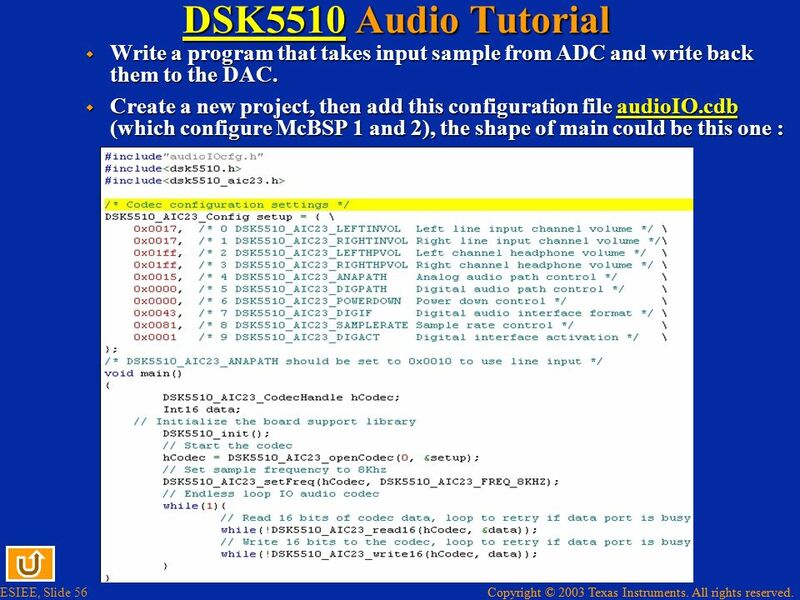 56 DSK5510 Audio Tutorial Write a program that takes input sample from ADC and write back them to the DAC. 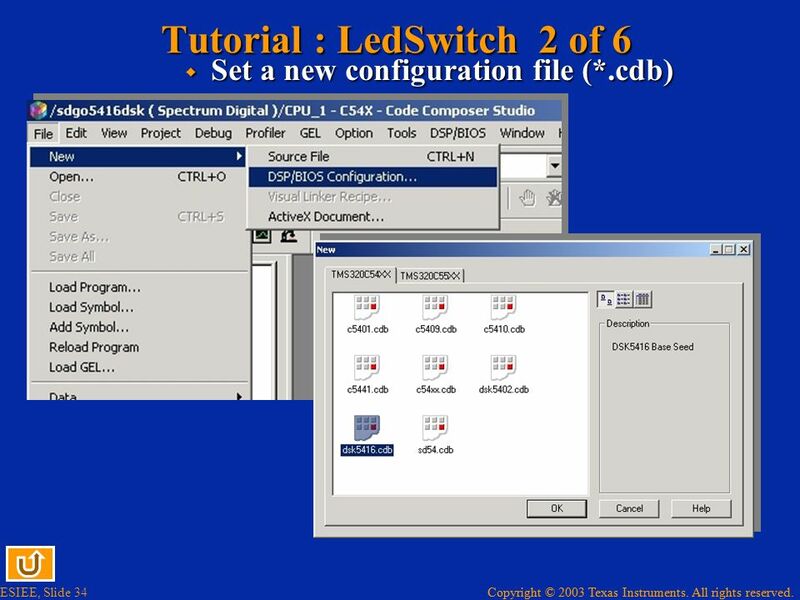 Create a new project, then add this configuration file audioIO.cdb (which configure McBSP 1 and 2), the shape of main could be this one : The (#include) part takes the header file generated by the configuration step « audioIOcfg.h », the header file that allows to use specific functions for DSK5510 and another one for further declaration specific to TLV320AIC23. Then there is an array « setup » which contains configuration value for TLV320AIC23. (refer to datasheet). The main program declares an handle to access to the codec. 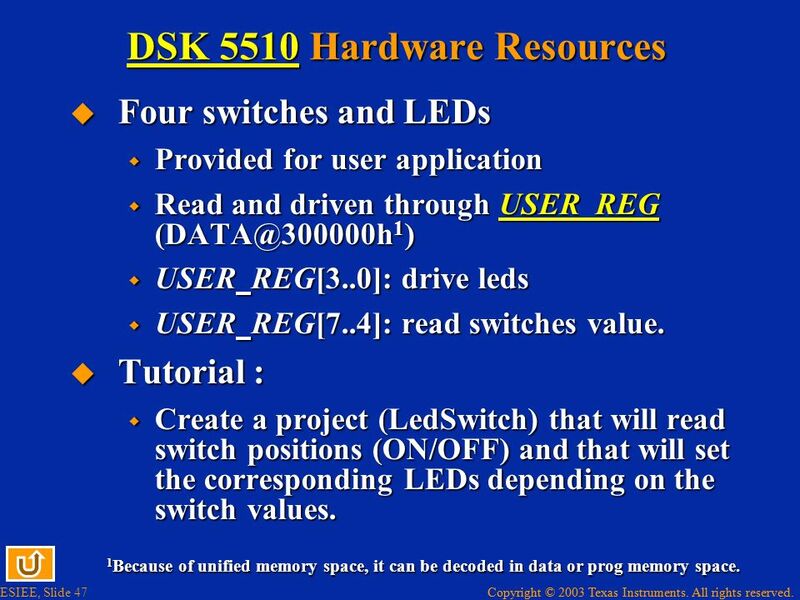 The board is initialized through « DSK5510_init() » as in the previous tutorial. The codec is opened with initialization array as a parameter. The sampling frequency is set to 8 kHz. Then the program enters in an infinite loop, where it waits for something to read from the ADC. 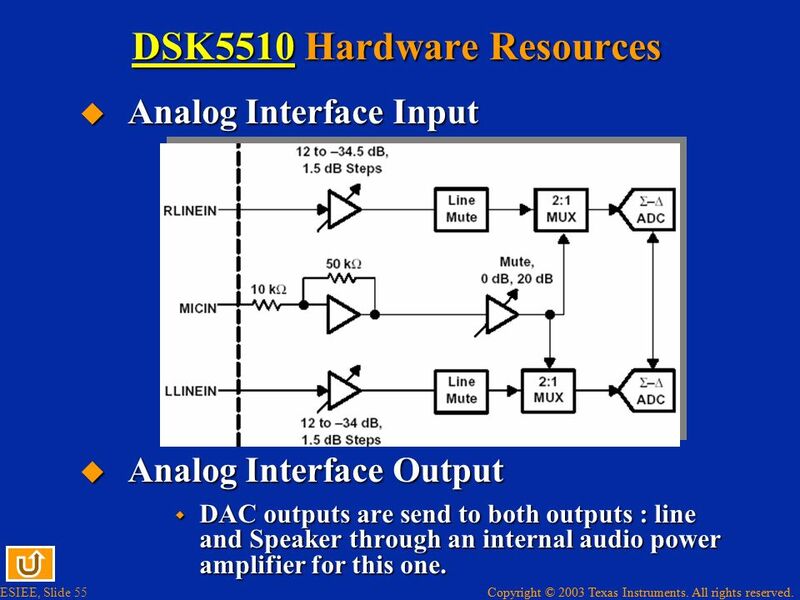 As soon as the ADC sends a sample it is written back to the DAC, then the program waits again for a new sample. 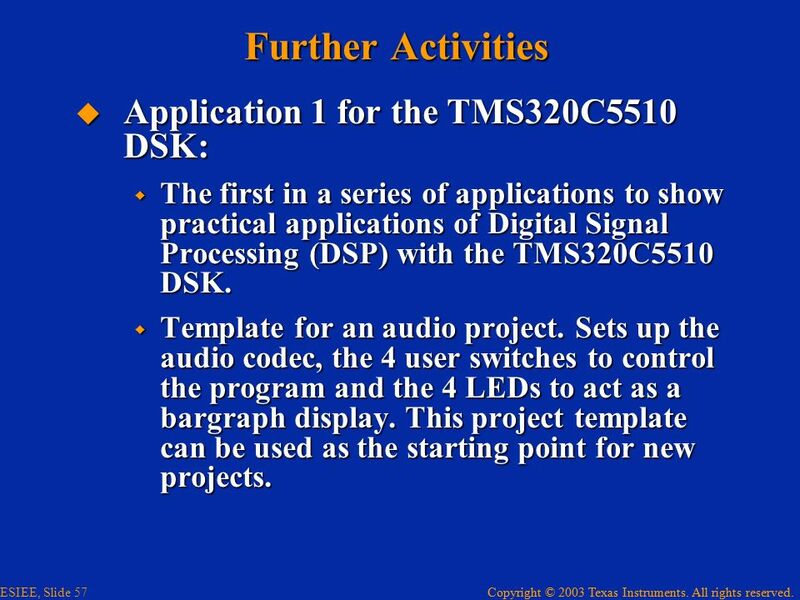 The first in a series of applications to show practical applications of Digital Signal Processing (DSP) with the TMS320C5510 DSK. Template for an audio project. 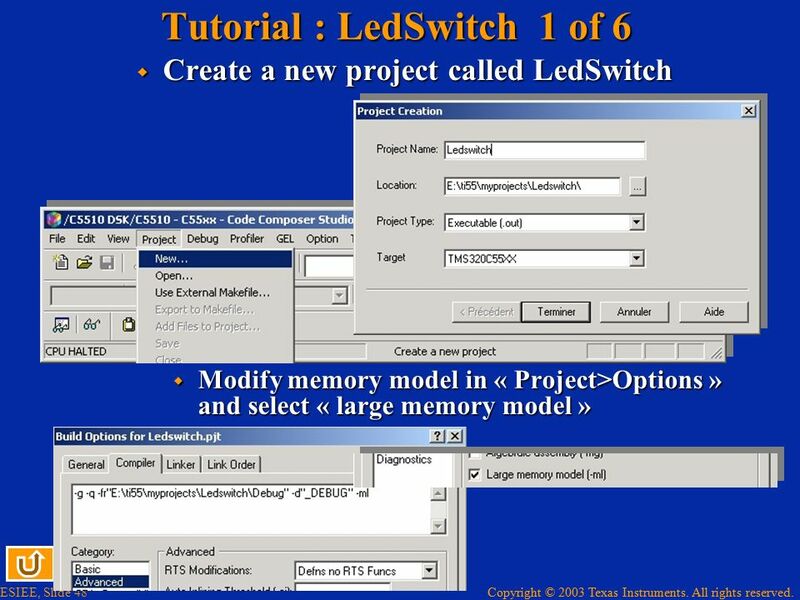 Sets up the audio codec, the 4 user switches to control the program and the 4 LEDs to act as a bargraph display. This project template can be used as the starting point for new projects. 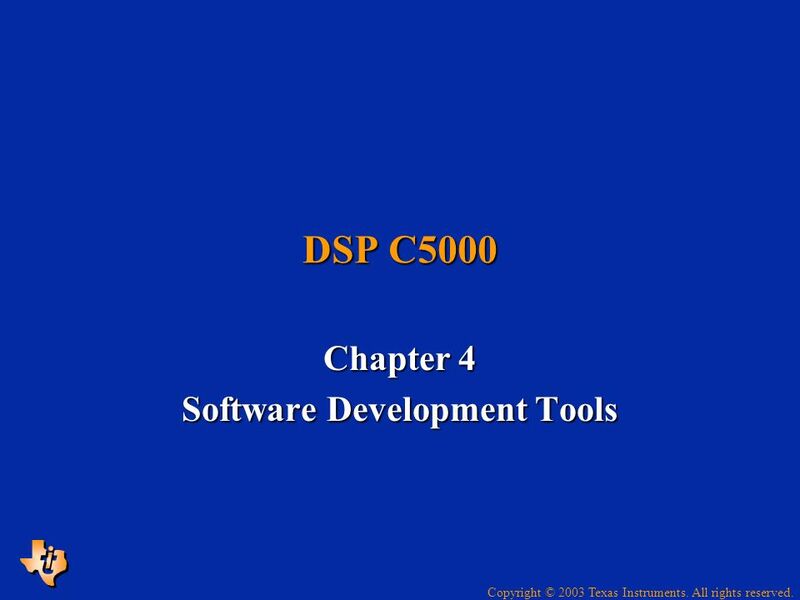 Download ppt "Chapter 4 Software Development Tools"